Median sales price of homes sold in Gainesville and Alachua County was $144,000, an increase of a little less than 1% over the first half of 2013, when the median sales price was $143,000. 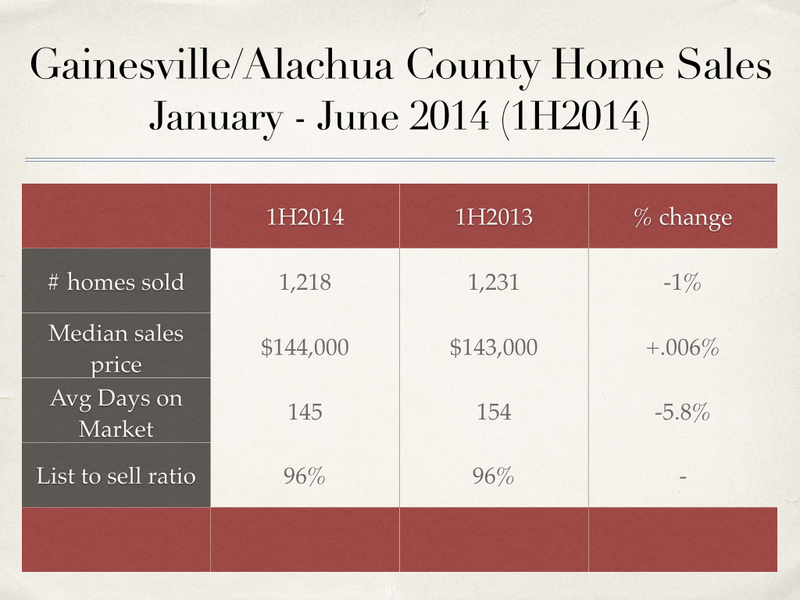 The average time to sell a home in Gainesville and Alachua County decreased 5.8%. It took an average of 145 days to sell a home, as opposed to 154 days in the first half of 2013. 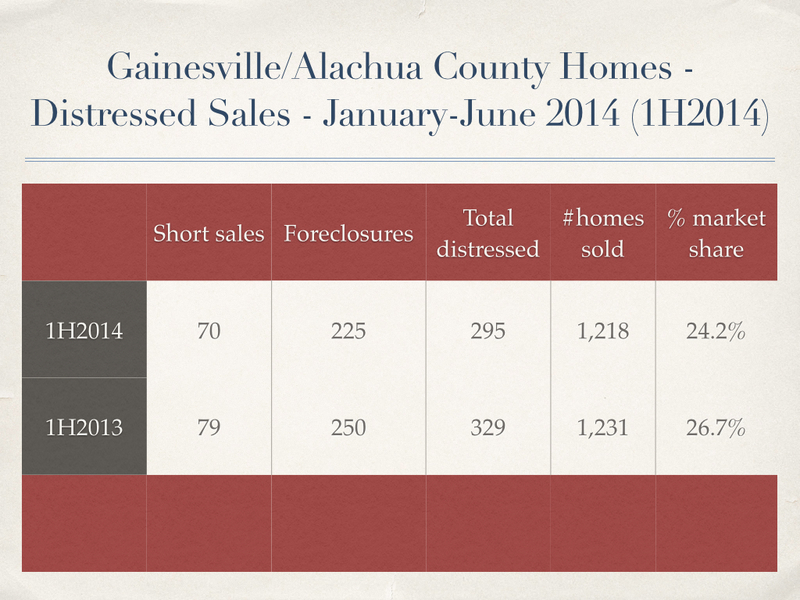 Short sales and foreclosures continue to comprise a substantial share of home sales in Gainesville and Alachua County. 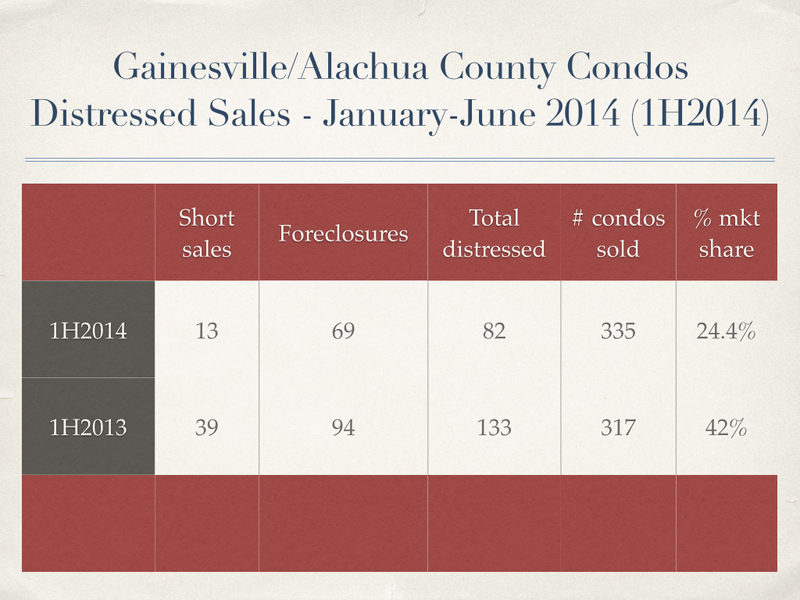 During the first half of 2014, distressed sales represented 24.2% of all homes sold in Gainesville and Alachua County, down from 26.7% during the first half of 2013. The Gainesville condo and townhome market is recovering nicely. Median sales price of Gainesville and Alachua County condos and townhomes increased 14.3% over the first half of 2013. The median sales price of Gainesville condos and townhomes in the first half of 2014 was $80,000, vs. $70,000 during the first half of 2013. The number of Gainesville and Alachua County condos sold increased 5.7% over the first half of 2013. Short sales and foreclosures represented 24.4% of all condo sales during the first half of 2014 — a significant drop from the first half of 2013 when distressed sales represented 42% of all condo sales. The Gainesville real estate market continues to improve. Distressed sales will continue to hold the rise in sold prices down in neighborhoods where there are a lot of short sales and foreclosures.